The International Powder & Bulk Solids Show will be the world’s largest powder processing and bulk solids handling event in 2016. Taking place between May 3-5th at the Donald E. Stephens Convention Center in Illinois, the event will bring together decision makers from a wide array of industries and all across the supply chain. With an outstanding legacy of connecting the processing community since 1976, the 2016 show returns to celebrate its 40th anniversary. As the global leader in sieving and separation technology, Russell Finex will showcase its full range of vibratory screeners, round separators and ultrasonic deblinding systems. On display for the first time will be the new Russell Screen Changer™, an easy and reliable screen deck lifting device to effortlessly replace mesh screens by one operator. Designed to reduce downtime by making screen changes faster, an innovative interlocking safety system also safeguards the safety of the operator. The Russell Screen Changer™ can be attached to any round check-screener or separator – even if it’s not a Russell Finex model. 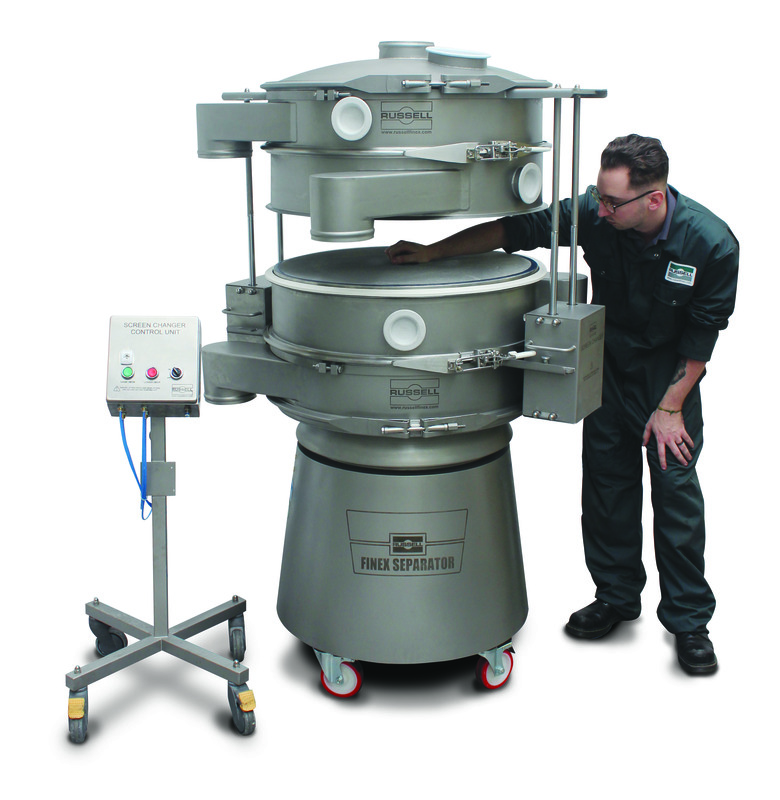 The Russell Compact Airlock Sieve™ is a high containment circular vibratory sifter that ensures dust tight processing. The user-friendly sieve incorporates the patented TLI (Twist, Lock and Inflate) airlock clamping system to improve product quality and protect operator safety. With a line-up of over 300 suppliers, 21 technical workshops and 36 insightful education sessions, Russell Finex has been selected to participate as an expert speaker in the Powder Show Conference. On Tuesday May 3rd, Richard Kay, Business Development Manager at Russell Finex will take center stage to present a technical training session on utilizing sieving and screening technology to achieve perfect powder quality and high productivity. The technical training session will focus on tips for selecting screening equipment, performance and optimization of screening processes, as well as screening equipment design and control. Throughout the 3 day event, Russell Finex will have a team of specialized sales engineers available to answer any questions and provide full machine demonstrations. With over 80 years of experience, Russell Finex is dedicated to providing screening and separation solutions to processors in the powder and bulk solids industries.